STEEM is hands down the best community we've come across, yet the developers here are at the mercy of Steemit Inc., and the execution of their roadmap. A major reason we chose Steem was the promise of Smart Media Tokens, which has not yet materialized. As of December, we've begun testing our own off-chain logic and ways to consensus upon it. 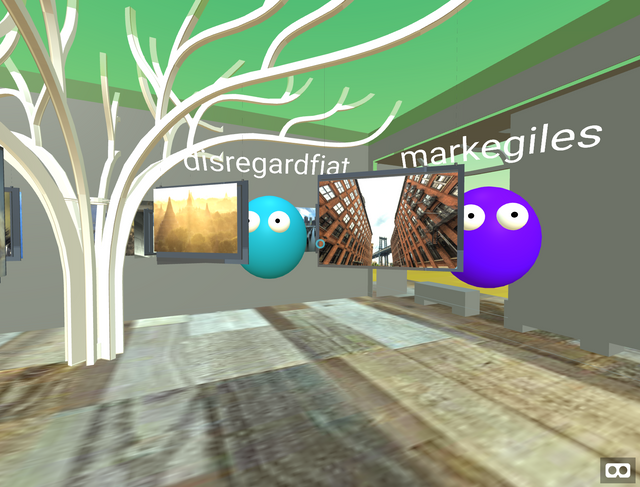 We are @disregardfiat and @markegiles, and together we've had our nose to the grindstone for a year now on Steem. We are dreamers and doers, and to our knowledge we've built the most capable dApp platform on any chain, supporting most web technologies in decentralized ways. Our Virtual Reality containers can use standard libraries and don't require slimmed down versions of engines like other crypto-projects. Our AR containers can serve dynamic location specific data from the same dApp. We've even pioneered methods to secure IPFS's local storage and domain/cookie problems from public gateways. And now we're using STEEM-STATE by @shredz7 to build off-chain logic that supports dApps and users in awesome new ways. In short, we've been seriously committed to bringing the best possible tech and trust to you. Steem remains the best platform with the best community, and our belief in you is what drives us forward. DLTs represent a massively disruptive technology. However, one only has to gesture to an 80% fail rate for ICOs to know that they are only one piece of the solution. While there are an infinite number of actions an individual or group can take to both advance or retard the growth of Steem, there are finite options that can be consented on by the community. Proposals such as changing reward pool allocation, witness duties and other similar on-chain solutions fall in this finite group. All changes made at this level only require a majority of elected witnesses to implement (however fairly they were elected). Organizing legal entities in global jurisdictions "elected" via nearly any mechanism is a soup sandwich. Requiring months of research, lawyers... elections just to determine types of elections. A near guaranteed source of continual drama. Ideas such as worker proposals a la BitShares provide a completely voluntary method to fund enhancements and features, marketing campaigns... as well as fund and even receive proceeds from organizing events. These will lack consensus but will enjoy no drama from uninterested parties... as their resources aren't being inflated or taken away. The grander ecosystem has not been kind, and Steem has been hit especially hard, falling as much as 95% from all time highs. Due to this we've seen comparatively naive projects surpass our valuation such as Dogecoin and Tron. With these, and other factors, Steemit Inc. had to lay off 70% of their employees and redefine their focus. After more related drama, they announced they were interested in building a stronger community by distributing some controls and resources, as it would be mutually beneficial. The "Steem Alliance" was proposed to begin seeking solutions. We've been hard at work providing the features necessary to implement worker proposals, as well as numerous types of smart contracts and meta-tokens. The next public demonstration of our framework will be a location based AR scavenger hunt in LA, secured by a dlux NFT smart contract, for 200 attendees on-boarded to Steem. Our DEX provides an open market with no appreciable information asymmetries. In addition, we've taken steps to improve user on-boarding: This side-chain forms an ad-hoc network of Steemians that autonomously seek Nash Equilibrium in a new market for Account Creation Tokens, addressing the serious concerns of user-base growth. We have several videos and posts in the last few weeks explaining in great detail how these new transaction techniques and pricing feedback mechanisms work. Funding or no funding, this remains our goal. 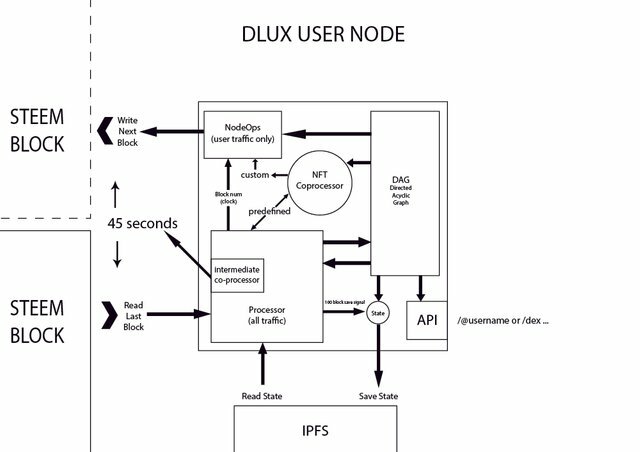 DLUX has always been envisioned as a resource. If our goals are aligned, we'd appreciate your help in development and funding, which you can easily do by sending STEEM to @robotolux, automagicly entering you in to our DLUX side-chain ICO auction! That's right, our software is already most of the way there... all on STEEM!!! Every 100 blocks sign and save state, report last hash of saved state. Nodes read all reports to determine consensus. Nodes configured for restarts will reload last data from IPFS if failed. Users A lock funds either in DAG as DLUX or in Escrow as STEEM/SBD between Nodes A & B. User B buys contract with DLUX or Escrow to User A.
Node A and B release funds to Node B. Node B places User B's Colateral Amount in DAG. Node A receives 1 'win' for 1 escrow_approve; Node B 2: escrow_approve and transfer. ICO bids are totals and tokens distributed via logic. I think this is one of the better Steem based projects out there! I'm putting a little money where my mouth is. I've sent Steem to @robotolux a few times and have acquired some DLUX tokens. I would encourage others to research this project and support it if they feel inclined to do so. But wait... who would actually pay you ... or anyone... to do that? That's where worker proposals come in. "Yo D.Tube needs a search. Here's 10 STEEM, anybody else wanna pitch in?" @disregardfiat Great to see your project moving forward! It's one of the most interesting on the platform here. So DLUX is a DAG, unlike STEEM which is a DPOS? Steem is also a DAG, the data structure. DPOS is the consensus mechanism.